Babies grow so fast. And because of that, the baby equipment which there parents or relatives buy for them remains unused and new. Sometimes, some of the equipment gets used but still looks like new. These are easily reusable for other babies. Instead of buying whole expensive new stuff for newborns, it would be a better idea to get some used equipment. Because, either way, they will not be used for a long time as the baby will grow soon. There are a lot of middle class, low-middle class, and low-class families, who can’t afford to buy all the necessary baby equipment for their new-borns’ brand new. So, it will be the great help for them if they can get all the necessary equipment with less money. Even if the equipment is old and used, it will be okay for them. As the number of the possible buyers are way more than that of the quantity, I think it is going to be a profitable business. Because, you already have a target market and customers, who are pretty obvious to come to buy these products. 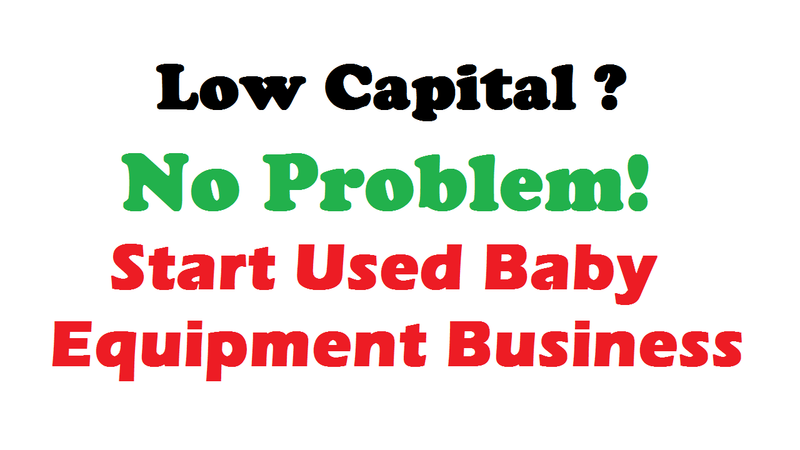 Without putting any extra efforts, you can start a successful old baby equipment’s business. In this type of business, you will not need a huge amount of capital. But, that doesn’t mean that you will not need capitals at all. Of course, you will need. Which business doesn’t? But the amount will be a bit less than that of others’. Because you will not be buying intact products from the main companies or factories. You will be buying products from the users, who have already used those products or equipment. The price will be way lesser than that of a new one because it has already been used before. So, the expenses behind your business products will keep you budget smaller which literally every businessman wants. But the expenses behind others stuff will remain same as other businesses. Such as the rent of the shop, electricity bills, taxes, employees salary and etc. After the shop, you will need materials to decorate your shop. Especially, for keeping the equipment. Such as tables, hangers, shelves, small Almira, etc. You will need different types of these things for different equipment. So that the buyers can easily find what they need or have been looking for. If your budget is too little, you will not even need any shop for your business. Just buy few portable tables and bags for arranging your products. You can set your old equipment business on street or footpaths. This is the easiest way to reach your target customers. They will easily notice you while walking on the street or passing by it. And in this way, you will also don’t have to spend extra money for renting or buying a shop. It is a hard working business. And for that, you will need a few people to help you with works. Baby equipment is very small in size and that is why it takes a lot of time to arrange the products based on their size and other individual characteristics. You will also need a few people for cleaning and be looking after the shop. And for doing all these works, you will need workers or employees. You can either hire workers as part-timers or you can also take help from your friends and family. Either way, it is okay. Because all you need is a few helping hands in an exchange of money. So make sure to hire some workers even before you start your business. In the meantime, you will create a little understanding of them and it will be helpful for your business. As the main ingredient of this business is the old used baby equipment, then it is pretty obvious to say that you will have to collect or buy old equipment. If you want, you can go to people door to door for buying those stuffs. Or, can wait for them to come to you on their own. You can even divide your shop I’m two parts. I’m one part, the sellers will sell their old equipment. And, in the other part, you will sell them to the customers who are intended to buy them. If the old equipment is not clean or washed you can clean or wash that for better selling. Even though they are old and used, you can still earn quite a lots of profits by selling them if you can present them to the customers in a good way. Selling and earning is actually the main parts of a business. So, when you are done with your settings and arrangements, you will ready to make the final movement. And the final movement is to earn profits. I hope you have enough business knowledge to understand how profit works. Basically, you will have to sell the products at a higher price than that if you bought with. You can’t fix the price very high because your target customers do not belong from high society. Otherwise, they wouldn’t have come to you to buy old stuff instead of new ones. So you should keep that in mind while fixing the price. Not so high, not so low, but in a standard rate. So that you can make few money through that. You have already completed all the necessary steps to start your business. Now, only one thing is left and that is the opening. I hope you find this helpful and make the best use of this. If you can work hard, you will surely become successful in this business. My best wishes are with you. Good luck with your new business.